Style. 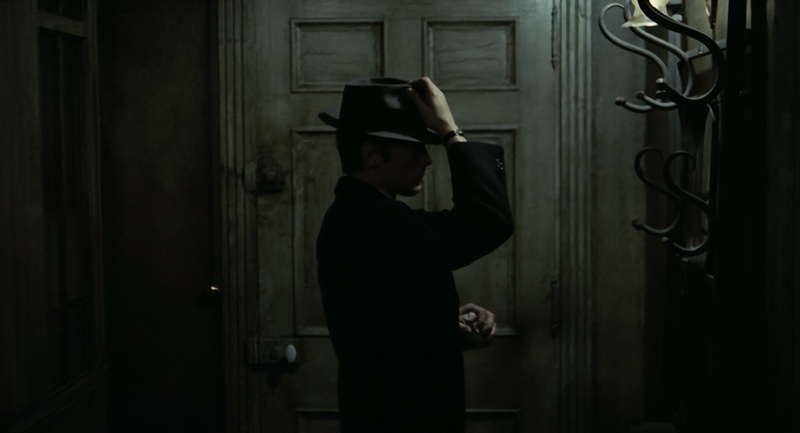 This is a key argument in Le Samouraï. 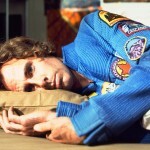 We are first introduced to Jef Costello, the main character, in his austere, dark, bare room. Fully dressed, he is lying stiffly on the bed and starts puffing on a cigarette. After a while, he gets up and, before going out, puts on his trench coat and fedora hat, adjusting the brim in the mirror with delicate precision. Everything about him is cool and calculated. It’s like he’s fitting himself for battle. And just like that, the movie has established its character’s path and inevitable conclusion without a line of dialogue. 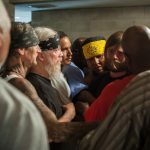 The entire shot maintains a simple and equally expressive composition throughout, confined to the grey-blue tones of Jef’s apartment, a backdrop that, on the sound of the chirping of the caged bird in the room, suggests the character’s solemnity and imprisonment in his own destiny. 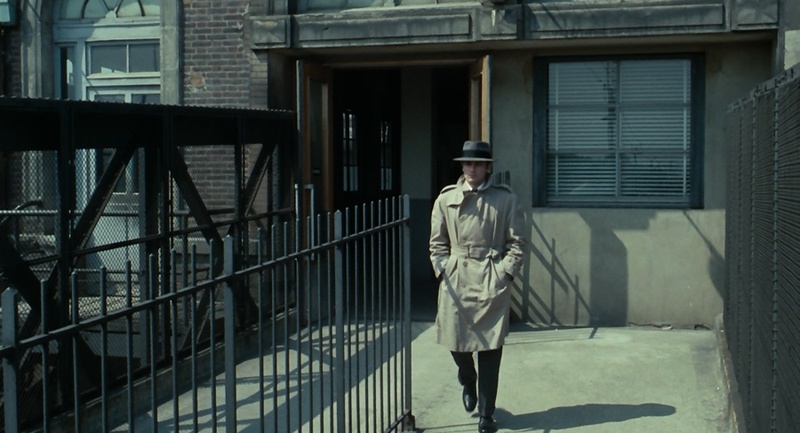 Delon recedes in the safety of his trench coat. It’s his armour. 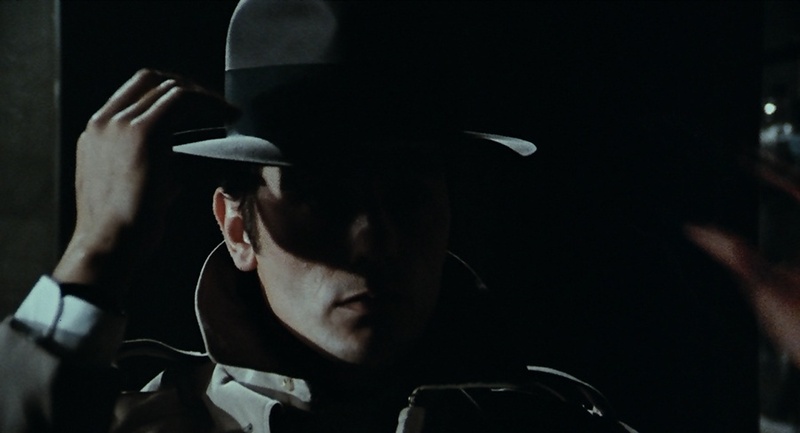 Together with the tilted downward hat, the trench is also part of what has come to define the classic film noir protagonist. 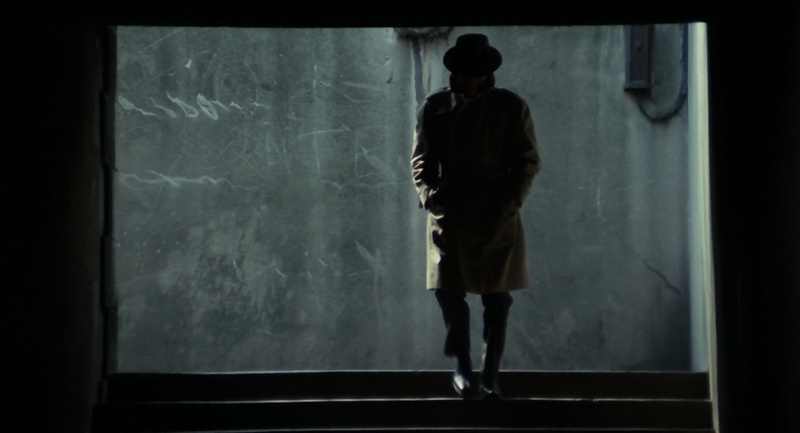 “There is no greater solitude than that of a samurai, unless it is that of the tiger in the jungle… perhaps…” reads a quote at the beginning of the film, in fact fabricated by the director Jean-Pierre Melville. 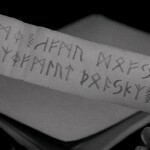 Nonetheless, it perfectly illustrates Jef’s disciplined isolation. Like a samurai, Jef abides by a code of conduct and leads a solitary existence. His dressing is like a ritual, systematically putting on his hat and coat before getting a job done. 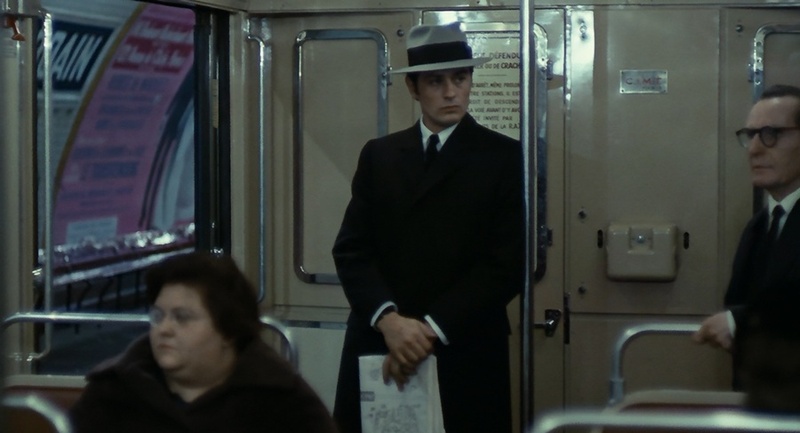 In a career-defining performance as a Parisian contract killer who has realised he is being double crossed by his employees and seeks revenge, Alain Delon conjures Melville’s perfect anti-hero whose particular moral code finds a great visual equivalent in the director’s perfectionist approach to film-making. He keeps everything else simple and refined. The trim grey suit, seen in an iconic silhouette that is still relevant today, the black slim tie and white button-down shirt, the plain white t-shirt, another classic suit – this time black, the inky wool coat: his clean-cut clothes are not only essential to his lifestyle, but when taken out of context, represent the gold standard for men’s style. Throughout his career, Melville retained a passion for all things American, especially classic Hollywood gangster and noir movies. 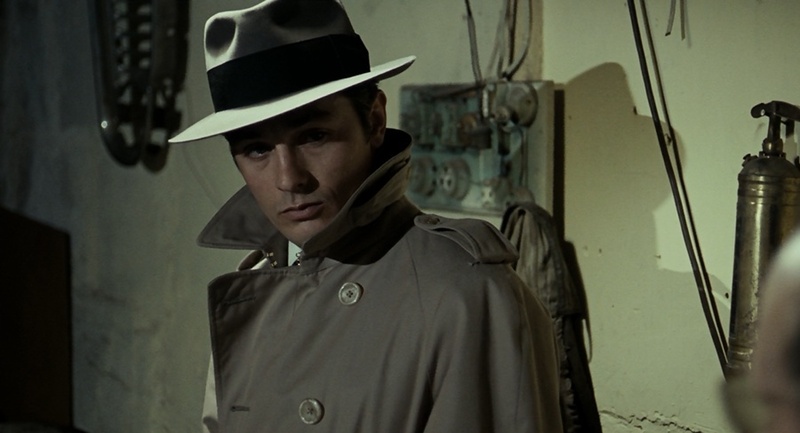 As shown in Le Samouraï, he eagerly borrowed the iconography of the genre – the snap-brim hats, the belted trench coats, the cars and nightclubs – but made its conventions entirely his own, tailored on his highly stylised world. 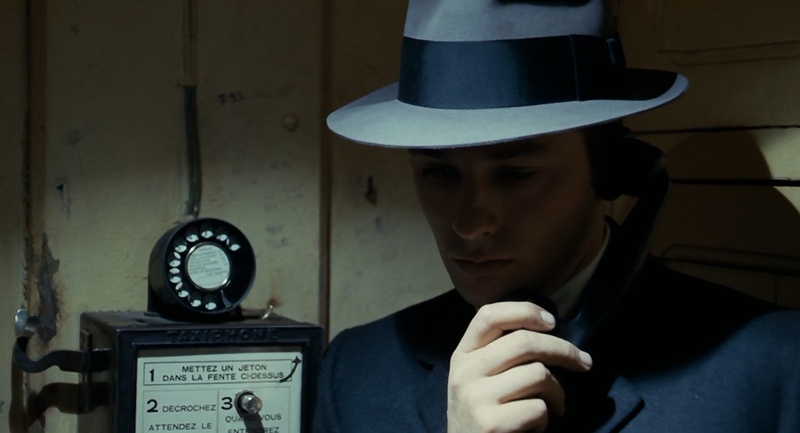 Even the film’s colour scheme, mainly retaining the blue-grey palette found in the opening scene in Jef’s apartment, and the play with light and shadow are a clear nod to the black and white of film noir. 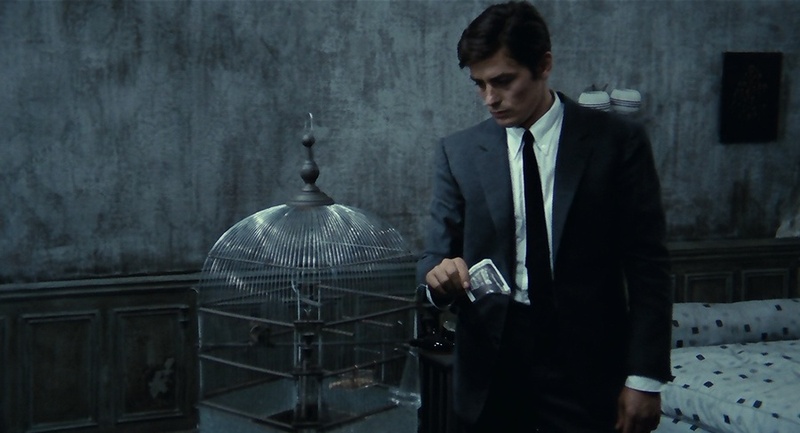 Delon’s exceptional good looks and impeccable appearance meet Melville’s idea of the gangster as an image. 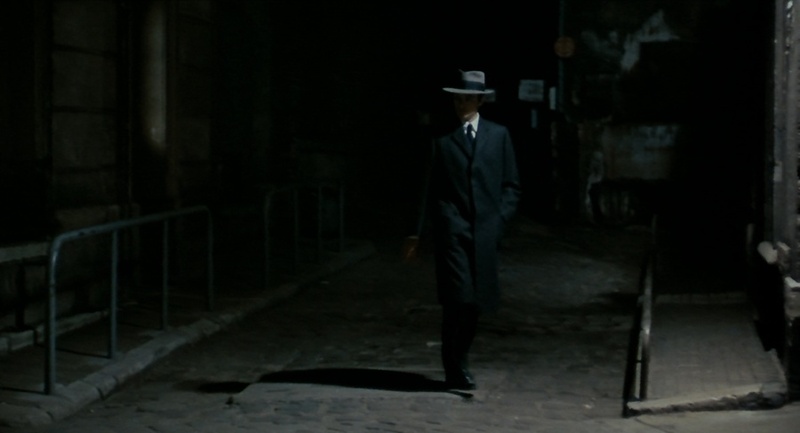 Clothes make the man in Le Samouraï. 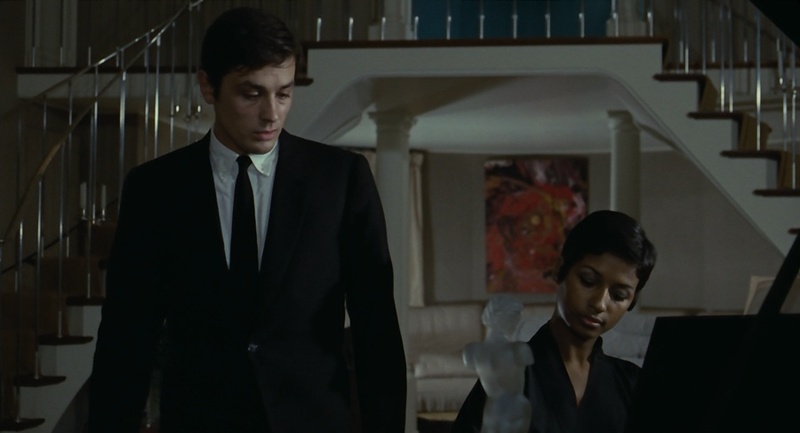 Delon is dressed with the finest precision, but he seems completely unaware of his appearance. He’s utterly detached, hardly betraying an emotion. It’s part of the job, of his profession. There is a scene towards the beginning of the film, where Delon, stopped at a traffic light, is watched admiringly by a pretty young woman. His body language is minimal and signals that he has noticed her gaze, but he only gives her a blank look and turns away, not even satisfying her with a smile. Nothing distracts him from his fateful path.